I took off Friday for my son’s 6th birthday. As per his wish, we spent some time meandering through the Magic Kingdom doing what he wanted to do (mostly). The day started with ride over to the park on the monorail. Believe it or not, that was my first ride on the transport since the tragic death of monorail purple’s pilot. The system functioned as it should, there may have been a couple extra cast members on the platform, but for the most part things were the same as they ever were. We tried to time our arrival with the little show that takes place at the train station as the park opens to guests. It’s a cute show, but it seemed most of the cast members were just going through the motions and the guests that were selected to open the park really didn’t do any thing much. 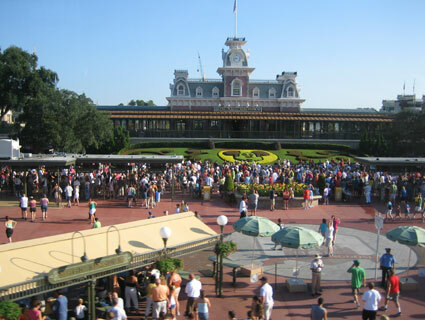 I think it’s time for some new magical moment to be created here, hopefully one that doesn’t involve crowding hundreds of people into a small area and then forcing them to move through an even smaller passage way all while strollers run over their toes and elbows are thrown jostling for position. So having survived Disney’s version of the Running of the Bulls, what do we do next? Head to our first Fast Pass? No! Not this day. We went straight to the Harmony Barbershop where the official festivities for “Pink Hair Day” were set to begin.